I adore your attitude! You had a rocking week! Keep it up! Choosing fruit over junk? Hello NSV! Biking to the re-enactment, awesome. You are off to a great start. You had a good first week. Here’s to a great second week! 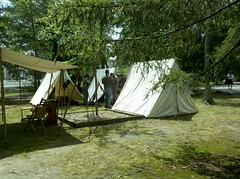 The civil war reenactment sounds like a blast!! Gratz on doing the boot camp…it scares me. working out after doing the bootcamp is a double win in my book! Great job! It seems like you had a TON of non-scale victories this week!! That’s awesome! And you’re attitude this week is great!